June signifies a change of seasons in Greece. The days get longer and hotter, meaning it's the perfect time to check out the many beautiful beaches. The Cyclades​ have some of the best beaches in not only Greece but the world. The famous cluster of islands is located in the vibrant Aegean sea and is home to over 80 beaches. Whichever one you go to, there will be something distinctively wonderful about it. Kleftiko is known for its rich blue waters and secluded caves and can only be visited by boat, while Sarakiniko is famous for its white rock formations. You can find a private place at both of these beaches to enjoy with your partner. If you are after some peace and quiet to relish the company of the one you love, Milia Beach in Skopelos​ is often free from crowds. The white sand and pine trees with the calm aquamarine ocean make for the perfect place to take a romantic walk. During the summer, a beach bar opens its doors so you can enjoy an ice-cold beverage as the sun sets. Nas Beach in Ikaria is the place to go for rustic charm. The tiny fjord is flanked by mighty cliffs on both sides and is made up of white pebbles and crystal clear water. Wander inland and you'll find the ruins of a temple that worshipped the God of love, Aphrodite. Other breathtaking beaches include Balos in Crete, which is another of the best secluded beaches, Myrtos in Kefalonia, known for being the most photographed, and Porto Katsiki Beach in Lefkada with a luscious pebbled shore and deep waters. Throughout Greece, you'll find traditional villages that have maintained their ancient charm. Chora, the tiny village on the tiny island of Folegandros, is untouched and beautiful. Known as the Island of Peace, as soon as you arrive you and your partner are bound to instantly feel relaxed. In the centre of the town you can enjoy a meal in quiet and lovely atmosphere with the light fragrance of the lime trees and homemade bread wafting over you. Couples are often drawn to the village of Monemvasia. Large areas of the town remain from when it was a fortress in medieval times – walking down the cobbled streets, past authentically ancient stone buildings, you will get a real sense of the history of the town. In the lower part of the town you can explore more of the history in buildings such as the Muslin Mosque, the Archaeological Museum and the Byzantine churches. There is a delightful restaurant on the roof of a tower house that serves up delicious food. If you're visiting Greece, Santorini is a must. 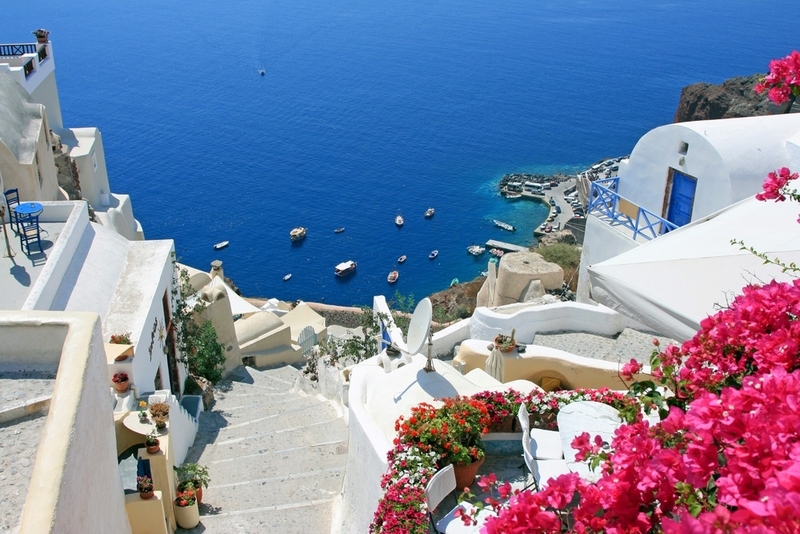 The best villages of this island are Fira and Oia. The latter is on the northern side of the island and is famous for it absolutely magnificent sunset. You can see this from throughout the village that rises up the cliff face. Oia is made up of beautiful buildings and churches with distinctive blue roofs and authentic architecture. Enjoy the sun from your veranda or explore the area through the narrow streets and on picturesque paths and finish your day at a tavern with a meal of fish that was caught on the same day. Whether you're reclining on a beach or wandering through a village, Greece is sure to show you and your partner a wonderfully special and romantic time.